While the Irish Fellowship Club has been around since 1901, its charitable arm, the Irish Fellowship Club Educational and Cultural Foundation, is celebrating its 40th anniversary of providing grants to Chicagoland parochial high schools. 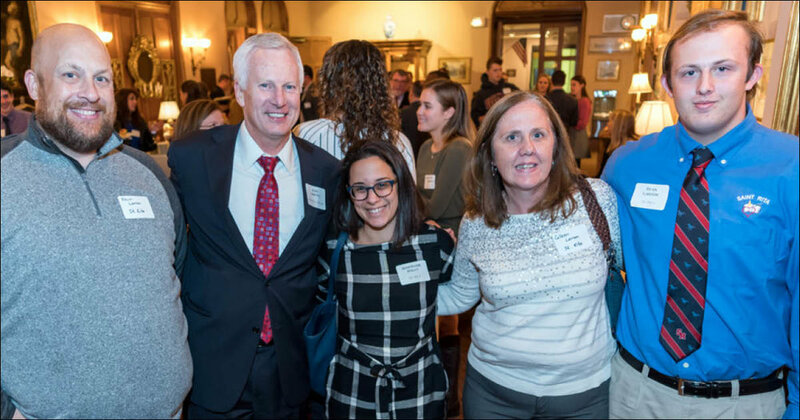 The Foundation held a reception at St. Ignatius High School on October 23, 2017, to recognize this milestone. Since 1972, the Foundation has donated over $2,300,000 to high school scholars. Presently there are 36 schools receiving grants. Approximately 30 schools were represented at the reception. Irish Fellowship Club president, Chris Kozicki spoke of the challenges facing the Irish when they came to America and the importance of faith and education to them. “Catholic Education was very important to help catholic immigrant’s children become successful in society. Many past and current leaders and members of the IFC have attended many of these great high schools that are here today. Forty years ago, under the direction of President Art Dunne and Don Ryan, the club made a commitment to fund scholarships for children of Irish decent at our local Catholic high schools. Through the years there have been demographic shifts and some schools no longer have children of Irish decent but the IFC is proud to honor our commitment to these schools.” Foundation President, Jack Hartman echoed Kozicki’s theme and emphasized the Irish Fellowship’s commitment to Catholic education and the effect it has had on its graduates. Mr. Larson, John Griffin '69, Rosemarie Boldt, Mrs. Larson and Ryan Larson '19 recently represented St. Rita by attending the Irish Fellowship Club Reception in honor of the IFC's strong commitment to Catholic education. Maura Gribble of Mother McAuley, Dan O’Leary of St. Ignatius and Tim Sullivan, a graduate of Marist High School, expressed their gratitude and the impact their grant and Catholic education has had on their lives. The keynote speaker was Mary Dempsey, president of DePaul College Preparatory. Ms. Dempsey pointed out that 79,000 students attend 229 schools in the Archdiocese of Chicago. The graduation rate is 98% and over one billion dollars of taxpayer money is saved by Catholic education. She joined in thanking the Irish Fellowship Club for its support.